The bain-marie stainless steel double boiler is a shallow hot water bath in which another container is placed for slow and even heating. It is commonly used for melting chocolate or maintaining the delicate temperature of a sauce. It has one handle into which the water is poured. This double boiler is constructed of durable stainless steel and features one handle into which the water is poured. Place candy canes or peppermint candies in mini-food processor and pulse until in small pieces. Set aside. Line a 15x10 jelly roll pan with foil, letting it hang over the sides. Grease foil with nonstick spray. 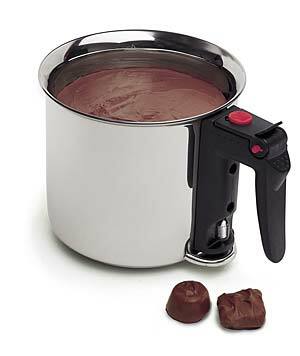 Melt the chocolate chips in a double boiler over medium-low heat. Pour evenly into jelly roll pan and smooth with an offset spatula. Sprinkle with 1/4 cup peppermint candy. Place in refrigerator until cold and firm. Heat white chocolate chips in a double boiler over medium-low heat until chocolate is almost melted. Remove double boiler insert from pan and stir until completely melted. Stir in extract. Cool slightly. Pour this over chocolate layer, and, working quickly, spread to cover. Sprinkle with 1/2 cup crushed candy. Chill until both layers are firm. Lift foil out of pan and shake off excess candy. Peel foil from bottom of peppermint bark. Trim edges. Cut into 2" squares. Click the button below to add the 1.5 Quart Stainless Steel Double Boiler Bain Marie to your wish list.